I bought this sauce at Trader Joe's, along with a package of chicken thighs and two zucchinis. 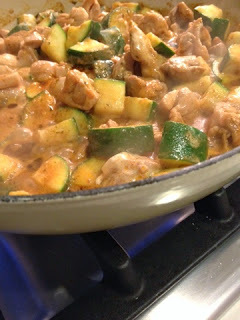 Here's the recipe: Cut up four chicken thighs and 2 large zucchini into chunks and sautée them in a bit of olive oil until chicken is not pink. Then dump in the sauce. Stir. Cook for 5 minutes. Hide the sauce container. Serve.